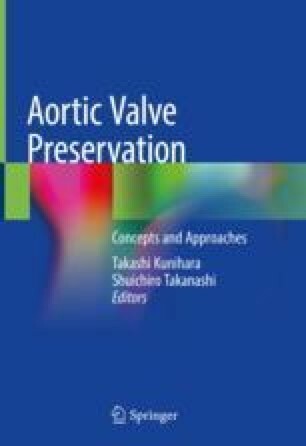 We believe that most patients with aortic valve stenosis are suitable candidates for valve replacement in the current era. However, valvuloplasty is indicated in some cases, such as young patients who will require reoperation for prosthetic valves over the long term and suffer from concomitant stenosis due to localized sclerotic lesions. The methods for valvuloplasty include decalcification and slicing of the sclerotic lesion, and partial cusp replacement using tissue such as the autologous pericardium. We present two applicable cases.